Ready to Start Your San Diego Quiz? The city of Coronado was founded as which type of city? San Diego was first discovered and claimed by which prominent nation? In the late 1800s, who was considered to be the wealthiest man in Southern California? The Dole Fresh Fruit facility at the Port of San Diego is responsible for bringing in 185 million of what every month? The San Diego port was created in what year? The word “Loma” for Point Loma is Spanish for what? In the early 1800s, the Kumeyaay Indians used Coronado for what purpose? When European settlers began to develop the Coronado area, which animals outnumbered humans by about 10,000 to 1? What tree replaced the orange trees on Orange Avenue? The Wright Brothers’ historic flight was just over 23 years after Charles Lindbergh’s flight in 1903. The Cabrillo National Monument commemorates the establishment of the resort city of Coronado. Hotel del Coronado is America’s second largest wooden structure. 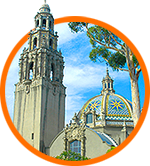 Balboa Park is named after a Spanish maritime explorer. John Spreckels’ father began a Sugar Refinery in 1863 at San Francisco. In 1963, the Naval Air Station North Island was recognized as the birthplace of naval aviation. The Naval Amphibious Base in Coronado was established during WWII to train landing craft crews. The Japanese Friendship Garden was built as a memorial to the loss of Japanese lives after WWII. The average temperature in San Diego is 70 degrees, with about 10 inches of rain each year. Little Italy in San Diego was originally established as a fishing village. San Diego is sometimes called the __________ of the Pacific Coast. The first settlers in the area where the _________ Indians. What is the largest convention held at the San Diego Convention Center every year in July? How many pounds of bananas does the average American consume annually? What do the sand dunes at Coronado beach spell out? Who first claimed the area of San Diego for Spain? San Diego’s second oldest cemetery dates back to______. What year did the Spreckels Theatre open? Who is considered the father of San Diego? The Naval Air Station was granted official recognition as the _______________ in 1963. How many times has the Star of India sailed around the world? What movie starring Tom Cruise was filmed at the Kansas City Barbecue? What is the third largest industry in San Diego? What year was San Diego first discovered and claimed for Spain? The trail that connected the missions was the El Camino Real or ______________. What connection does San Diego have to Lindbergh and his plane? Charles Lindbergh is famous because he___________. Lane Field is the original home of the ___________. How many mall levels are in the Horton Plaza? Why is the Livingston House called “Baby Del”? What was Spreckels Park originally called? What city is considered the birthplace of California? San Diego is the oldest permanent _________ settlement on the West coast. What is the number one imported fruit into the United States? In what state was Dole Food Company, INC founded? Who spelled out “Coronado” with the sand dunes main beach? What year was the Star of India built? Who is Lane Field Park named after? What year did Spreckels Theatre open? What year was the William Heath Davis House built? Which park allows you to bring your pet to one game every year? After what natural disaster in San Francisco, 1906, did John Spreckels move his family to San Diego? Spreckels Sugar was founded by which of John Spreckels family members? How big is Spreckels Park? What year was the Coronado Golf Course built? *The Secretary of the Navy established Naval Amphibious Base Coronado in 1943 to train landing craft crews. Navy Underwater Demolition Teams (UDT) in trained in the Caroline Islands during WWII. The U.S. Navy SEALs were established by President John F. Kennedy in 1962. In what year was the San Diego Naval Base established as a U.S. Destroyer Base?